Had a bit of a post-PBW hangover (plus a day job conference) last week, so I never quite got around to sharing with you the best beers I encountered in the previous week. Three were encountered during Philly Beer Week. The other two were featured samplings that I included at my book signing appearance at the Antietam Farmers Market in Reading, Pa. this past weekend. 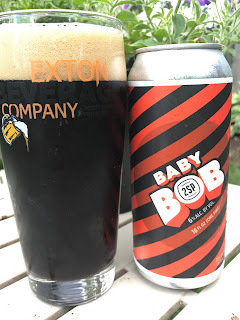 At my book signing in Reading, of the seven beers I took for sampling (perhaps with the exception of the 17.1% Avery Mephistopheles), none other was as captivating as the Baby Bob. People seemed as curious about the name as they were the liquid itself. As an acknowledgement to brewer Bob Barrar's award-winning ways with his Russian Imperial Stout, this smaller Baby Bob is a roasty, easy-drinking American Stout. Peaches. Tart. Brett. That's perfect enough description. Encountered during a visit to Tria Taproom from Allagash's owner Rob Tod, this is the second beer of theirs that went overboard in impressing Philly Beer Week-goers earlier this month. The last day of Philly Beer Week has several usual suspects. Fergie's. Local 44. And Dock Street. In past years at Dock Street, you could count on my Beer Runs. The brewery's Music Festival. This year, they only recently opened the new "Cannery + Lounge" in an adjacent property behind the brewery on 50th Street. They took a quieter route to ending PBW this year. With two canned releases. Summer in Berlin and Golden IPA, both in 16-ounce cans. The IPA hit all the right notes for me. Then again, with the Mosaic, Citra, Simcoe, and Amarillo all-star hops with just a touch of haze (not cloudiness, mind you), I wouldn't have expected anything less out of Mark Russell's brewhouse. In a Facebook post during Philly Beer Week, I'd mentioned something about "...being honest...should be paying more attention...." To Manayunk Brewery, that is. And, it took this spectacular apricot sour at Strangelove's during a cross-town walk on a 94-degree last day of PBW to remind of that. No doubt it's the Hallertau and Tettnanger noble hops in this German-style Pilsner from one of Bucks County's finest that made this another fan favorite at my book signing event....and also after the power-washing project later in the day. In case you wonder how much a favorite this is of my own, as well, look no further than my home kegerator which has seen more than one of these sixtels pushing up beer through the taps.